Acts as natural laxative. Works for cleansing colon. Aids in weight management. Helps lower cholesterol level. Acts as anti-inflammatory & arthritis helper. Triphala churna is a powerful antioxidant and a rich source of vitamin C. Moreover the combined nutritional benefits of gooseberry, bibhitaki, and haritaki can provide you with a plethora of health benefits and help improve your overall health. Triphala churna benefits has recently got scientific validations for various medicinal properties. Triphala has far more antioxidant and anti-inflammatory properties than its individual ingredients. It helps protect body from harmful effect of free radical and reduce body inflammation. 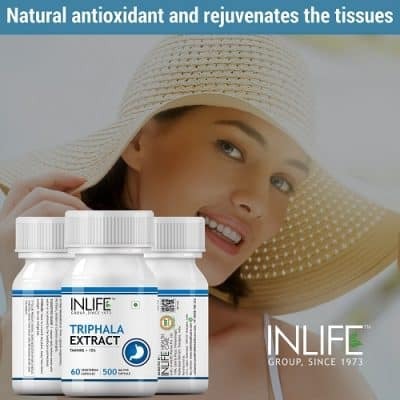 It reduces risk of disorders of internal organs. 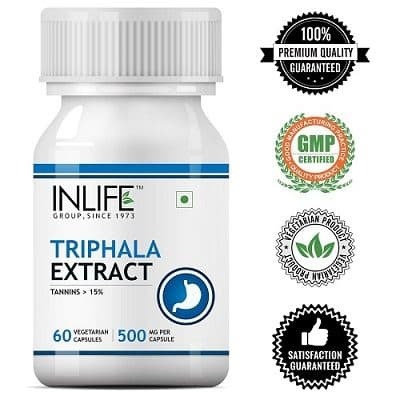 INLIFE Triphala extract capsules is effective over reducing joint pain in arthritis. 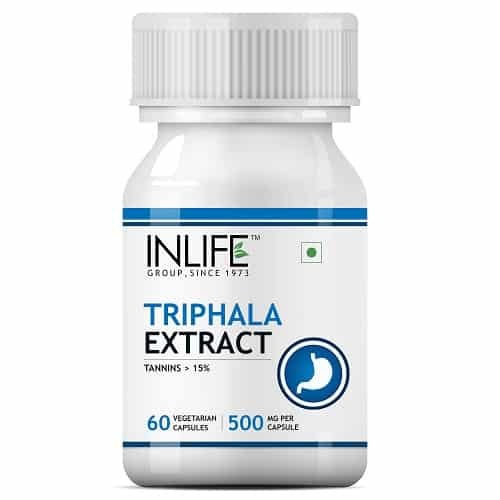 INLIFE Triphala extract capsules helps to alleviate your digestive problems and improve the health of your digestive system. 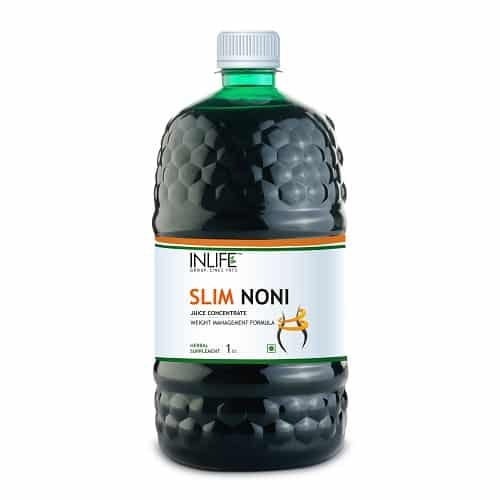 It can help to remove the dangerous toxins from your intestinal tract, cleanse the liver and kidneys and purify your blood. Triphala is a mild laxative and help to prevent constipation. It is also useful for other digestive disorders like flatulence and bloating. Triphala churna has been found to stimulate your appetite, help in digestion of the food and maintain normal bowel movements. Being a powerful antioxidant and a good source of vitamin C, triphala churna can help in improving your immunity. 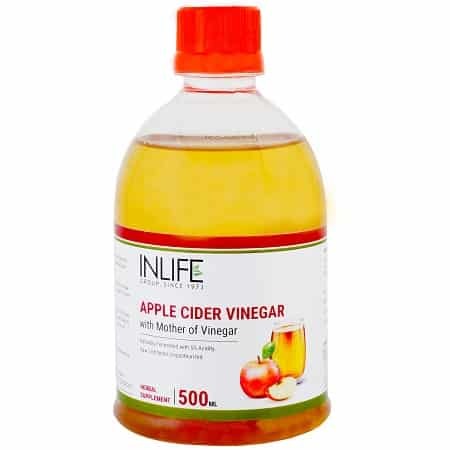 Moreover, it has anti-viral, antibacterial and antifungal properties that protect you from the various disease causing germs. Further triphala helps in immune activation which helps in increasing immunity and protecting against various diseases. Triphala churna aids in weight loss by cleansing your digestive system, promoting easy digestion, increasing blood circulation and by increasing your metabolism. By promoting the healthy assimilation and absorption of nutrients, Triphala controls your hunger pangs and keeps your body well nourished. As you know that triphala can reduce weight and obesity. 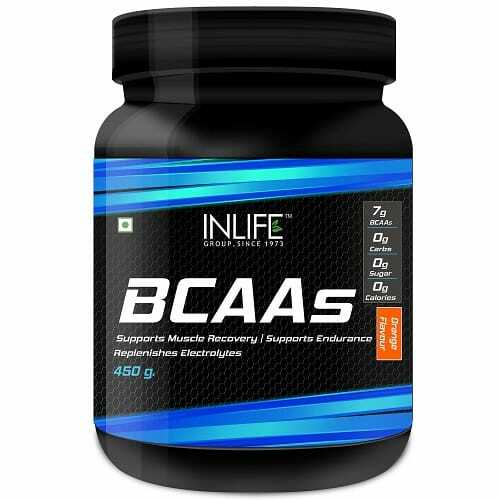 It is one of the top health supplements for weight loss. As you know that triphala churna has anti-cancer properties which makes it a potential element in the treatment of cancer. 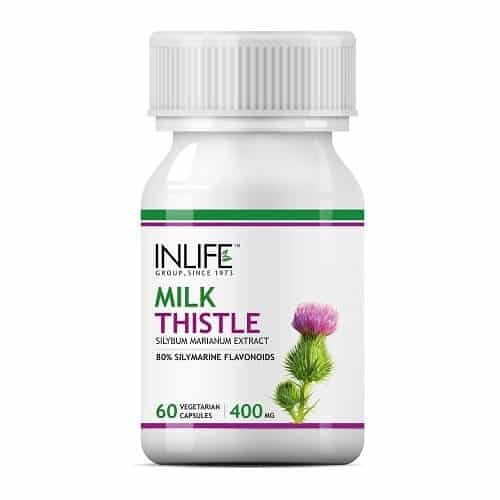 This supplement has the ability to destroy the cancer causing cells while sparing the healthy ones. As all know that triphala helps to slow the growth of human pancreatic tumors which were grafted onto mice. Triphala in inhibiting Angiogenesis or new blood vessel formation in malignant tumors. Further it was observed that Triphala has far more antioxidant and chemo protective potential than its individual components. Triphala churna has been found to improve the functioning of your brain. It helps in boosting your concentration level, improving memory and mental abilities and also in relieving tension. It also stimulates the nervous system and is used to prevent conditions like diabetic neuropathy. Regular consumption of Triphala is considered h is one of the best remedy for hyperacidity and Gastro Esophageal Reflex disorder – GERD. It provides relief in GERD symptoms like heart burn and works as cooling agent. Boiling triphala churna in water and then consuming reduces its laxative effect and makes it easier to consume daily. Triphala churna helps in maintaining better reproductive health in males and females. 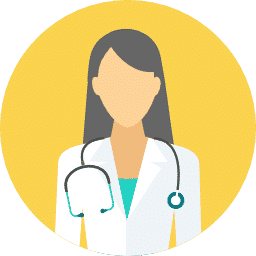 The different kinds of abnormalities associated with the female reproductive system such as amenorrhea, dysmenorrhea, leucorrhea, irregular menstrual periods, excess bleeding, vaginal dryness, etc can be treated with the consumption of this supplement. In males, triphala churna helps to increase the sperm count as well as to improve the quality of the sperms. 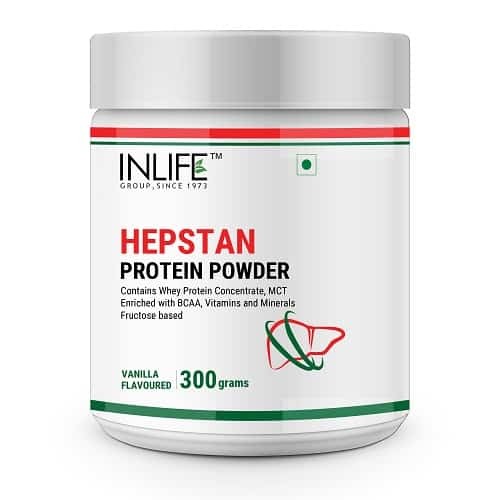 Hair problems including graying, hair loss or unhealthy hair is a usually a sign that your body is not getting that essential nutrients it requires. Taking triphala churna can help you with your hair problems by providing all the nutrients needed for the healthy growth of your hair. It can strengthen the roots of your hair and even prevent graying of hair to a great extent. Triphala can provide effective cleansing and conditioning of your hair and hence has been widely used in many hair care products. Triphala churna is excellent for your eye health. It helps to improve your eyesight and strengthen your eye muscles. It is very helpful in treating many eye conditions like impaired vision, glaucoma, cataract, conjunctivitis and myopia. Triphala churna also helps in nourishing the tissues and nerves of your eyes. The antioxidants present in triphala churna contribute to preventing oxidative stress caused by free radicals and may help in preventing macular degeneration. 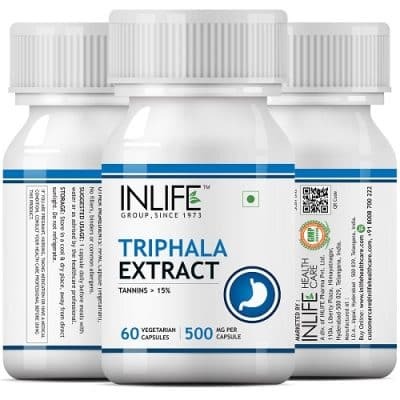 INLIFE Triphala extract capsules are 100% vegetarian capsules, it contains 60 capsules per bottle. Im impressed with the results and would recommend this product to all. 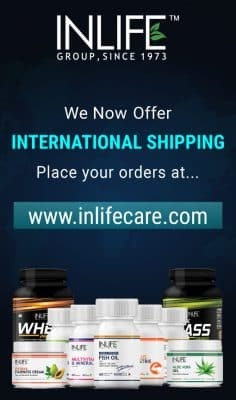 I have been using this brand for a long time, it works. I highly recommend if you have a problem with constipation. Good cleanser like products of this company. This is first time I’m having triphala, I guess it works fine. 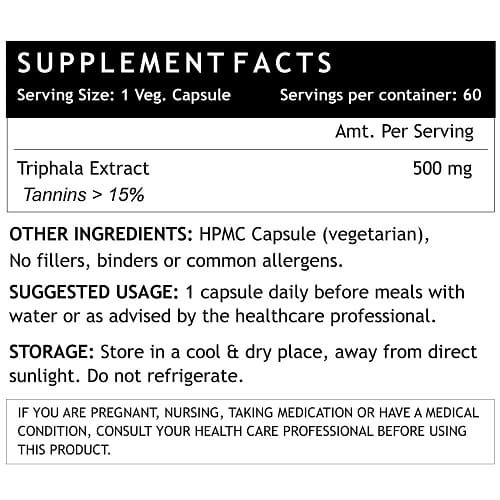 Triphala is only product I found that works consistently. I am now regular. Great product and priced right. 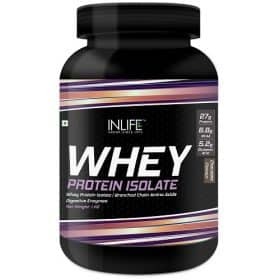 I have recommended this product to several friends and it has regulated them as well. 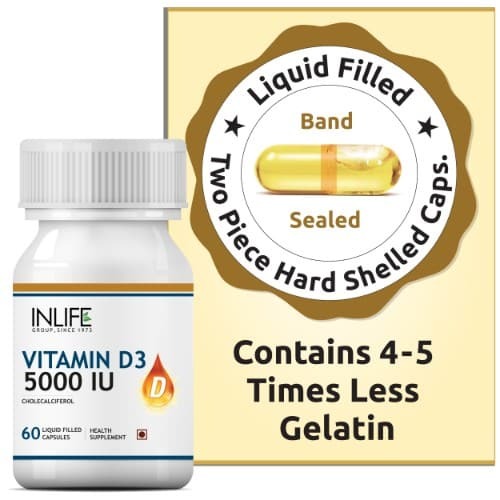 Nice supplement, easy to use in capsules. Tried in powder, but the taste was disgusting ? 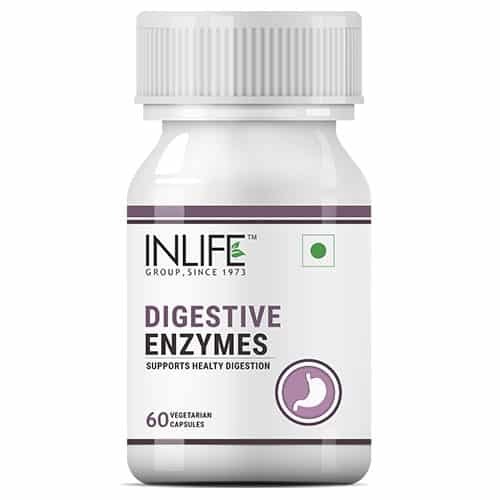 This is a great product for people who have digestive issues of any kind. I started this supplement last week and they really help the system quite nicely. “Triphalia is a great product boosts regularity but lends immune support. Triphala supports healthy digestion and absorption. Hoping for better results and will update soon….